Congratulations! I am so excited you have decided to start a cake business. If you are the go to baker for friends and family then starting a cake business from home will be the best investment you make. You will be joining an exclusive network of small business owners throughout the UK and all around the world. Not everyone has the guts, passion or determination to set up on their own. Whether it is a part-time business or full time venture. You are on the road to creating your very own successful business, and that in its self is highly commendable. But what do you do once you have decided to start your business. You’re a passionate cake maker but maybe you don’t belief in yourself that you are a business woman/man? Maybe you not exactly sure what steps to take first? Maybe you are feeling a little about what to do next? But you are certain you want to create a business that you can be proud of you, that your husband/partner and children can be proud of. You want to create beautiful cakes and bring in £500 – £1000 plus per month. You want to treat yourself, family and friends. So how do you get there! HMRC/Gov.uk – brilliant UK website full of advice on how to set up a sole trader, register for self assessment, and more. Start and Grow Enterprise (SaGE) – a University of Gloucestershire project with funding from ERDF, running from August 2017 to December 2019, helping new businesses to start up and grow in the county. Open to all Gloucestershire based pre-start individuals and start-ups (trading up to 3 years) and is completely FREE! Activities include inspiring start-up events, two-day intensive courses and enterprise masterclasses, plus ongoing networking events, mentoring, resources, funding, co-working and incubation space. Enterprise Nation – fantastic business support online (I still love receiving their emails and attending their seminars and workshops). The road to setting up a cake business is filled with excitement and yet at the same time can be a little daunting if you are not entirely sure what you should be doing. 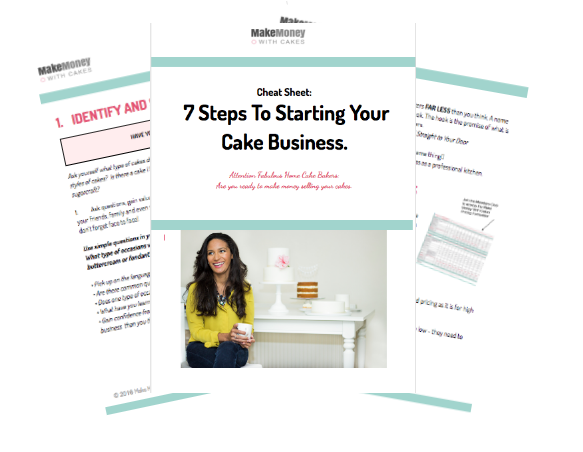 Already have a cake business, looking to grow it? Find out how I could help you grow your business with through my bespoke 1-to-1 business mentoring. Thank you for requesting your free gift. It is currently zooming it's way to your inbox as we speak.